Lausanne (SUI), 13 February 2019 — While 2019 is set to be another busy year for international horse sport, potential bidders are already vying for the possibility of hosting FEI World Championships in 2022. The FEI has already received some exciting expressions of interest for 2022, with more submissions expected before the 28 February deadline. “I am delighted to say that the level of interest and the quality of submissions to host FEI World Championships in 2022 has been very high so far, and we are confident that we will have an interesting pool of candidates to choose from when the allocations are made later this year,” FEI President Ingmar De Vos said. The FEI initiated a bid process for individual FEI World Championships in all disciplines for 2022 at the FEI General Assembly in Manama (BRN) in November last year. The FEI President stressed at the time that this does not necessarily mean the end of the FEI World Equestrian Games™ concept, and bids to host the full seven disciplines together for 2022 will be considered. The FEI Board unanimously approved the opening of a bidding process for individual world championships in all disciplines for 2022, with preference being given to multi-discipline bids. The Board also agreed that ideally the FEI World Championships for Dressage and Para Dressage should be combined. The world championships for 2022 in the Olympic and Paralympic disciplines will serve as qualifiers for the Paris 2024 Games. “Equestrian sport has become increasingly globalised, but there are relatively few countries that have the capacity to host world championships in all disciplines simultaneously,” the FEI President said. In a key change to the bid process, the FEI will host an interactive workshop at the end of March in Lausanne for all National Federations/Organising Committees that submit an expression of interest in the 2022 World Championships. “This interactive workshop is a key factor in ensuring that we adequately convey the structure, opportunities and minimum requirements of hosting the FEI World Championships 2022. By working more closely with the National Federations and Organising Committees from the very start of the process, we can ensure a unified vision and establish an achievable set of goals to work towards,” Ingmar De Vos said. There are over 4,000 FEI events organised world-wide annually across the seven disciplines of Jumping, Dressage & Para-Dressage, Eventing, Endurance, Driving & Para-Driving, Vaulting, and Reining, with world championships in the Olympic and Paralympic disciplines held every four years and every second year for non-Olympic disciplines. 28 February 2019 – Deadline for receipt of non-binding expressions of interest to host one or multiple FEI World Championship(s) 2022. All information can be accessed here. 26 March 2019 – Workshop to be held in Lausanne after which interested bidders will be invited to submit a formal bid, outlining their plans and visions for hosting FEI World Championships in 2022. November 2019 – Allocation of FEI World Championships at the in-person Board meeting at the FEI General Assembly in Moscow (RUS). All bids will be fully evaluated over the Spring/Summer of 2019. Questions concerning the bid process can be sent to bidding@fei.org. Margie Engle and Royce. Photo Credit ©AnneGittinsPhotography. Wellington, FL – December 1, 2018 – Margie Engle (USA) and Royce dashed to a well-deserved victory in the $205,000 Holiday & Horses Grand Prix CSI 4* presented by Palm Beach County Sports Commission at Palm Beach International Equestrian Center (PBIEC). Engle and Royce were the only pair to finish the evening with a double clear effort, securing their win ahead of Susan Horn (CAN) and Lillyfee, who captured second place with a time of 60.14 seconds in the jump-off. Eduardo Menezes (BRA) and H5 Quintol rounded out the top three placings with four faults and a time of 49.32 seconds. Engle and Royce are a notorious pair on the international competition circuit and with their win this evening, concluded one of their best seasons together yet as a partnership. Engle and Royce looked in top form, besting a class of 37 entries, finishing faultless in both the first round and the jump-off. The course, designed by Anthony D’Ambrosio (USA), saw rails fall throughout class and proved difficult for most entries. Emphasizing their attentiveness to flatwork over the past few seasons, Engle commented that their efforts are beginning to pay off in the ring, as Royce’s rideability has drastically improved as a result of their commitment to dressage work. The duo is concluding a banner year together, which featured top results in nearly each of the major international competition they attended. With her new mount, Dicas, on the rise, the balance it has provided for Engle works in Royce’s favor. While the pair has been a staple combination for the United States for the past few years, Engle feels that her and Royce are beginning to hit their peak as a pair, both growing together and developing a much stronger bond in the past twelve months. The two-round format of the class brought the top twelve combinations back to contest the short course and Engle knew that she sat in an enviable position with Royce heading into their final round. Sydney Conley Elliot competing at Great Meadow International. Photo: Shannon Brinkman Photography. Gladstone, N.J. – Oct. 4, 2018 – The United States Equestrian Team (USET) Foundation is pleased to announce this year’s recipients of the Jacqueline B. Mars National Competition and Training Grants: Sydney Conley Elliot, Emilee Libby, Frankie Thieriot Stutes, and Tamra Smith. The grants are awarded to eventing athletes who have been identified as having an impressive record and potential to represent the United States in future international competitions. These four riders will be traveling to the East Coast to attend The Dutta Corp. Fair Hill International CCI2* and CCI3* Oct. 18-21 in Fair Hill, Maryland. Elliot, of Bossier City, Louisiana, has been diligently training and competing with her partner of five years, Cisko A. The talented pair earned themselves a spot on the Tier 2 Training List after they performed the only double-clear cross-country round for the U.S. Nations Cup team at Great Meadow International in The Plains, Virginia, in July. Libby, of Temecula, California, made her mark on the eventing scene when she jumped around a CCI4* at just 18 years old before moving to California to source and develop top event horses. She brought her current mount, an 8-year-old Belgian Warmblood named Jakobi, through the ranks and her dedication to his training recently paid off as he moved up to Advanced Level in May. Stutes of Occidental, California, has had immense success at the CCI3* level with two top four finishes aboard her partner Chatwin, a 10-year-old Oldenburg by Contendro. The gelding, who Stutes has had since he was coming 6 years old, has never had a cross-country jumping penalty in 16 FEI starts. She is especially looking forward to competing at Fair Hill International as it will give her an idea on whether she and Chatwin are ready for the CCI4* level. Smith, of Temecula, California, also received the Jacqueline B. Mars National Competition and Training Grant in 2017 and is excited to see where the opportunity takes her this year with her horse, Mai Baum. The talented pair won the Fair Hill International CCI3* in 2015. Having the support of the USET Foundation as well as Jacqueline Mars is also something that Smith is grateful for as she continues on her path towards representing the United States at the highest levels of eventing. Smith also expressed her gratitude for the USET Foundation’s support as she received another grant from Jacqueline B. Mars that will allow her to travel to Boekelo, The Netherlands with her mare, Fleeceworks Royal, to compete on the Nations Cup team. “I just want to thank them not only for Mai Baum’s grant but also for the grant given to Fleeceworks Royal. I am so grateful for everything,” she said. Make sure to follow these athletes as they compete at The Dutta Corp. Fair Hill International CCI2* and CCI3* Oct. 18-21 by visiting www.fairhillinternational.com. For more information on the USET Foundation, visit www.uset.org. On the day of the “dancing horses,” The Netherlands’ Sanne Voets became the first ever non-British rider to win three gold medals in one major international championship before team-mate van der Horst put the icing on the Dutch cake by doing exactly the same. And topping off an incredible five days of competition there was a history-making moment when Japan secured its first ever Para Dressage medal at the Adequan© World Para Dressage Championships at the FEI World Equestrian Games™ in Tryon, USA. An imperious score of 80.150% was more than enough for Great Britain’s Sophie Wells to pick up her second gold of these Games in the grade’s Freestyle. Riding C Fatal Attraction, she finished ahead of The Netherlands’ Frank Hosmar and Alphaville N.O.P. who scored 79.155% to take his second silver. The day started with victory for Sanne Voets, and that first ever non-British triple in the Grade IV competition. Riding her beloved Demantur N.O.P. she scored 79.645% to finish ahead of Brazil’s Rodolpho Riskalla on Don Henrico who posted 77.780%. There was double joy for Team USA too, as Kate Shoemaker claimed the bronze on Solitaer with 73.230%. It was the host nation’s second medal of the Games and comes hot on the heels of their amazing fifth place in the team competition. A stunning display of control and grace by Italy’s Sara Morganti took the freestyle gold in the Grade I competition – her second of the Games. Riding Royal Delight, her horse for the past eight years, Morganti scored 78.867 ahead of Rihards Snikus of Latvia. Snikus, a keen DJ in his spare time, rode King of the Dance to score 76.113% and pick up his first ever global medal, having broken onto international scene at the FEI European Championships in Gothenburg in 2017, where he picked up a silver and a bronze. And double US joy turned to triple when Roxanne Trunnel, riding Dolton scored 75.587 to pick up her nation’s third Para Dressage medal by taking the bronze. There was a huge squeal of delight from Denmark’s Stinna Tange Kaastrup when she saw her score in the Grade II contest. Riding Horsebo Smarties she posted 78.947%% to take the gold ahead of Austria’s Pepo Puch on Sailor’s Blue with 75.500. The Netherlands’ Nicole den Dulk took bronze on Wallace N.O.P. with 74.573 – a replay of the grade’s individual and freestyle contests. The Grade III freestyle rounded off the day and The Netherlands’ Rixt van der Horst joined team-mate Voets as a triple gold winner, scoring 77.437% on Findsley. Continuing the USA’s incredible run, Rebecca Hart added silver to her bronze from the individual on El Corona Texel with an impressive 73.240%. Germany’s Angelika Trabert continued her return to the sport by taking the bronze on Diamond’s Shine, with a score of 71.840%. “It has been such an amazing year for the Netherlands. I have no words for it, both in terms of me and what the team did!” van der Horst said. So at the end of a brilliant week of competition, The Netherlands sits comfortably atop the overall medal table, with five golds, two silvers and two bronzes, followed by Great Britain with two golds, and one silver. Denmark is third with two golds and a bronze, while Riskalla’s two silvers give Brazil the fourth spot. The USA sits fifth with one silver and three bronzes. Photo: Julie Ross with her son Robert Ross. Wellington, Fla. – July 5, 2018 – As the mother of a professional rider who worked his way up through the ranks, Julie Ross has a keen understanding of the equestrian community from her view at the periphery. She knows about the drive and dedication of the equestrian community. Through her unwavering monthly commitment, Julie has singlehandedly funded over 100 doctors’ visits for horsemen whose lives and livelihoods depended on the care they received during times of medical and financial crisis. “Her contributions help ensure Equestrian Aid Foundation has the funds to get critically ill and injured equestrians back on their feet and, in most cases, earning a living by doing the work they love,” said board member Scot Evans. Julie is the motivation for the Equestrian Aid Foundation’s Change Rein Monthly Giving Program, an initiative that encourages members of the equestrian community to donate on a monthly basis. For questions about the Change Rein Monthly Giving Program or help setting up your donation, please contact Janise Gray at Janise@EquestrianAid.org. For more information, please visit EquestrianAidFoundation.org. Marilyn Little and RF Scandalous. Photo Credit ©Sportfot. Mill Spring, NC – September 2, 2017 – The fourth day of the 2017 USEA American Eventing Championships presented by Land Rover and Nutrena® saw another large group of divisions conclude with impressive show jumping rounds, while the remaining horse and rider combinations tackled their cross-country courses at Tryon International Equestrian Center (TIEC). Riders from the Novice divisions and a single Preliminary division were honored and recognized with final awards, while the Beginner Novice, Intermediate, and Advanced divisions will conclude Sunday, September 3. Marilyn Little and RF Scandalous produced a double clear show jumping round to keep a tight hold on their lead in front of an enthusiastic crowd, as they head into the final phase of cross-country in the Adequan® USEA Advanced Gold Cup division. The pair made easy work of the track underneath the lights to remain on their score of 27.8. In preparation for jumping under the lights, Little arranged for RF Scandalous, a 12-year-old Oldenburg mare (Carry Gold x Richardia) owned by Jacqueline Mars, Robin Parsky, and Phoebe & Michael Manders, to travel with her show jumping string to Balmoral Park in Chicago, IL to contest an evening class. Jennie Brannigan continues to sit in second place aboard her longtime and veteran mount Cambalda, a 15-year-old Irish Sport Horse by Balda Beau out of Cathys Lady and is owned by Nina Gardner. Brannigan, who managed an unusually sensitive “Ping” in the warm-up, encountered some trouble before heading into the ring, but produced a nearly foot perfect round to hold their placing on the leaderboard. “I had an interesting warm-up. I don’t think I’ve ever jumped that horse under the lights before. He was quite fresh and I thought that was going to be a good thing. I warmed up with Phillip and he was building square oxers. I don’t know if it was the combination of the lights, but I crashed into a jump and fell on my hand,” she explained. Angela Bowles traveled all of the way from the state of Texas to contest the 2017 USEA American Eventing Championships presented by Land Rover and Nutrena® and was thrilled with her rise up the leaderboard on Bliss III, an 11-year-old Dutch Warmblood mare (Corland x Lenja) owned by Alyssa Phillips. The pair was holding fifth place following dressage, but a strong show jumping round propelled them up the leaderboard where they now occupy third place. Jennie Brannigan has been busy gathering top finishes across multiple divisions throughout the week, and called this afternoon’s cross-county run a success. “Today was good. I ate some Mexican food, took a nap and woke up to watch Lynn and Donner ride at Burghley on the replay, and I was like, ‘All right, let’s go fast.’ And they’re both cool horses. They’re both only seven years old. “I’ve always believed in Twilightslastgleam. He loves cross-country and is a Thoroughbred, so he’s quite natural at it. He’s got a smaller step, so there’s a lot of options for doing different strides on this course, so I actually did one set of strides on one horse and one on the other, which is different for me,” she commented. Brannigan learned that Twilightslastgleam had risen the ranks to first place while she was already on course with FE Lifestyle. “You’re always wondering whether to go for time or not. On FE Lifestyle I knew I was tied for first, but on Twilightslastgleam I wasn’t sure, and then I decided to have a crack at it anyway,” she said. “So we’ll see how tomorrow goes. Both of these are exciting horses for the Gardiners, because we need the future, and they are the future, and it’s cool to see them stepping up to the game and into the spotlight,” she concluded. Charlotte Collier, aboard Parker Collier’s Clifford M, an 11-year-old Holsteiner gelding (Cristo x Naomi IV), sits in third after finishing with 3.6 time penalties on cross-country, improving her first day rank by two. The Novice Horse division saw Booli Selmayr and Thomas Duggan’s Kildare’s MHS Tampa, a 5-year-old Irish Sport Horse mare (Quintender x Lady Ligustra)remain in first place throughout all three phases of competition to finish on top of the division. Despite only working with this horse since the spring, Selmayr says that the young mare has taken to the atmosphere of Tryon International Equestrian Center (TIEC) remarkably well. “We got here Monday after a 15.5-hour drive from NY, so I was interested in seeing how she was going to be this weekend. It’s such a big atmosphere and she’s just five, but she’s been so calm the whole time. She’s such a competitor and she’s such a workhorse. She doesn’t really get flustered by anything,” she explained. Ashley Giles and her own Chayenne, a 6-year-old Trakehner mare (Elfado x Charima), also stayed consistent throughout all three phases to finish in second place. Giles explained that she qualified for this week’s competition aboard Chayenne after competing and winning their first show together with a broken back. Coming into the course, Giles was feeling the pressure, she said, but her mount performed beautifully nonetheless. “She was fabulous yesterday, and I thought the cross-country course was super fun, and I loved [how it twisted]. It was super fun to ride. I had never been sitting in this position before going into the final phase, so I was pretty nervous going into show jumping, but she went in, and she did her job. She’s a brilliant horse. Every day that I get to sit on her, I feel lucky,” she concluded. Jennie Brannigan rode Justine Dutton’s Arctic Tiger, a 5-year-old British Sport Horse, to a third-place finish, moving up from their previously-held fourth place rank and posting two double clear rounds. “Unfortunately Justine is hurt, so she asked me to take the ride. I had only sat on him twice before this week, and it’s his first AEC, so I know that she was really happy. I’m happy that she trusts me enough to take him out,” said Brannigan. “He’s a great mover, and this was a lot, since it’s a big atmosphere. He was a little nervous out on cross-country, but I was really impressed with him today. He went out and stepped up to the plate,” she concluded. Bailey Snyder and her own Corina, a 7-year-old Holsteiner mare (Acorino x Phaedre), cruised through the show jumping phase to remain at the top of the Novice Amateur division, maintaining the first-place slot they had occupied since Thursday’s dressage test. The pair has been climbing the ranks in eventing since Corina came to Snyder as an unbroken four-year-old, and she’s excited to see where they go from here. “I’m going into my senior year of college, so my goal with her is to just keep her happy and healthy. I’m up for whatever she is confident enough to do. We’ve got an easy fall planned after this, and then we will look to the spring to get to some good shows that we can travel to and see some more exciting venues. We will definitely come back to Tryon to see what she can take on. She’s still a young horse so we are trying to get her more confident and ready to move up,” she concluded. Savannah Welch and her own Langcaster, an 8-year-old Oldenburg gelding (Languster x Galiffi), maintained her second-place status throughout the week despite a hectic effort to save her horse from the path of Hurricane Harvey. “We are from Houston, so we kind of just threw the horse in the trailer and say ‘we are leaving NOW,’ two days early,” she said. As a senior in college, Welch said it’s sometimes difficult to keep a strict competition schedule, but she plans to end her fall strong, adding, “Maybe we’ll compete in more Novices and hopefully move up to Training next year,” she concluded. Krissy Smith Shellenberger and her own Invictus, a 7-year-old Holsteiner gelding (Ibisco x Viness SH) rose from fourth place to claim the third-place slot with a four-fault show jumping round. Ryan Bell and Way Jose, a 14-year-old Thoroughbred (Jose x Riverside Charmer) owned by Karen Czarick, climbed to the top of the leaderboard in the Novice Rider division at the 2017 USEA American Eventing Championships presented by Land Rover and Nutrena®. Bell, a dressage competitor that recently began eventing, won the division on his dressage score of 25.8. Megan Northrop maintained her first-place position throughout the phases aboard her own Fleur De Lis, a 7-year-old Thoroughbred mare, to finish on top of the Master Novice Amateur division. Sunny Courtwright and her 9-year-old Irish Sport Horse mare, Around Midnight, were crowned the final champions of the 2017 AEC. Courtwright lead the Junior Novice division from start to finish on her dressage score of 23.5. Courtwright and third place finisher Suzanne Stevens both ride out of Mike Huber’s Gold Chip Stables in Fort Worth, TX. “It’s really fun to be here with Sonny and my other barn mates from Texas,” commented Stevens. Suzanne Stevens and her own Smokin’ Boots, a 7-year-old Thoroughbred mare (More Smoke x Miss Boot Scoot) ended in third on a 28.8. “This is the biggest show my horse has been to, so it’s been a great experience for the both of us. She’s come so far,” Stevens concluded. Amanda Ruane and her own Bally Lord Who, a 9-year-old Irish Sport Horse gelding, maintained their lead in the Beginner Novice Horse division, mastering the track and continuing on their original dressage score of 22.3 to hold top honors heading into show jumping. Beth Stelzleni and Mighty Handsome, a 5-year-old Thoroughbred gelding (Mighty Magic x SPS Whitney) kept their second-place position with a score of 25.8, while Holly Payne-Caravella piloted Benjamin Button, a 4-year-old Thoroughbred gelding (Classic Alliance x Lively Lady) owned by Kathleen Hall, also maintaining their 25.8 score to remained tied with Stelzeni for second place. After moving up from third place, Leah Backus and her own Diamond of Truth, a 5-year-old Irish Sport Horse gelding (Salute the Truth x Mainways Queen of Diamonds), have taken the lead in the Beginner Novice Amateur division heading into the show jumping phase. Backus bred Diamond of Truth and has enjoyed bringing him along for the past few years, she said, and was excited to achieve her goal of making it to AECs this year. “I liked going up on the hill so that you could look out over the [cross-country] course,” she said about her ride. Despite two time penalties, Diane Zrimsek aboard her own Coronado Charlie, an 8-year-old Thoroughbred gelding (Bwana Charlie x Pleasure Hunt), sit tied for second place with Nicole Thomas and her own Here N’ Now, an 18-year-old Canadian Sport Horse gelding. After two phases Kathleen Bertuna and her own Millye’s Mojave, a 12-year-old OTTB gelding (Mojave Moon x Slew the Dragoness) have moved from third to first place in the Beginner Novice Rider division following their clear cross-country round. Bertuna was happy with her mount’s focus on the fences and said the course encompassed the many tests of horse and rider she’s seen all year. “There were a lot of tests, from the changes in terrain to riding towards and away from the warm up area, towards and away from the barn area, and the difference between the ring and the wet, sometimes muddy grass, up and down the hill-it definitely tested all those facets that we’ve been working on all year in all the different courses and put them all into one big course,” she explained. After nineteen years away from the sport and wanting to return on a safe horse, Bertuna connected with Millye’s Mojave last November. The Seattle Slew-bred gelding is “just a prince,” she said, and the pair will likely move up to Novice. “He is wonderful. He takes care of me and has gotten me back into the business very nicely. At the beginning of this season Beginner Novice was looking really big, but now it’s looking more manageable, so I’m hoping that there will be a nice move up in the spring.” For now, she’s just looking to put in an accurate and forward course in the show jumping phase. Kymberly Pullen and Sara Webb’s Homer, a 15-year-old Thoroughbred gelding (Golden Missile x Zaza), currently sit in second place 1.5 points behind Bertuna, while Amber Duncan and her own Renegade, a 10-year-old paint gelding (Reflecting Merle x Windy’ Rascal Dottie), hold third place. Carrie Griffen continues her lead going into the show jumping round, clutching first place aboard her own Feuertanzer ES, a 12-year-old Belgian Warmblood gelding (Nicholas x Daybreak) on their original dressage score of 23.3. Robin Barr and her own Tout Fini, a 9-year-old Thoroughbred gelding (Purge x Firehouse Waltz), maintain their second-place spot with a score of 24.8, while Cindi Moravec and her own Holloway have a new hold on third place after receiving a 27.3. Ashley Stout and her own Deo Volente, an 11-year-old Hanoverian gelding, remain on top of the Junior Beginner Novice Fourteen and Under division following their clear round in the cross-country phase. “We were actually a little fast-we had a minute left at the third to last jump, so we ended up doing some circles and making it through with four minutes and thirty seconds. I’m super proud of him,” she explained. “My plan [for tomorrow] is to get through without knocking anything down. I’ve looked at the course, and it’s challenging, but not too bad,” she concluded. Avery Cascarino remains in second aboard Gloria Cascarino’s Dudley Do Right, a 13-year-old gelding, with a score of 20, while Viktorija Petraitis and Our Little Secret, a 15-year-old Arabian gelding owned by the Petraitis Family, continue to hold third place with a score of 25. Brynn Hershbine and Rowan Edmonds both went around the cross-country without a hitch, so they remain tied for first in the Junior Beginner Novice division. If they both jump double clear in show jumping, it will be Hershbine who is named champion as she crossed the finish line closer to the optimum time of 5:02 with Julie Hershbine’s Cadenza Aria, an 11-year-old Oldenburg mare (Turnofthecentury x Whisper). Edmonds, riding Liberty Bell, a 9-year-old Thoroughbred mare (Hellion x Beth) owned by Michelle Jones was eight seconds faster. Sydney Lee accrued 1.2 time penalties with Sweet Georgia Brown, dropping her from third to fourth. Carson Birdsong moved up into third with Ballygrace Laralai, an 11-year-old Irish Draught mare (Glenlara x Significadre) owned by Brooke Birdsong. Jennie Brannigan moved up from second place to finish on top of the Preliminary Horse division concluding with a clear round in the show jumping phase aboard Grayson Wall’s Balmoral Oakey, a 10-year-old Australian Warmblood mare (Falchrich x Diamond Sea Road). Brannigan has been winning across multiple divisions this week and currently sits in second place in the competitive Adequan® USEA Advanced Gold Cup division aboard her longtime mount Cambalda. “I was joking around [earlier] because last year I brought a bunch of horses and I think only placed 15th with one of them, so I’d say this year has gotten off to a better start. I’m really grateful for that and I just hope that I can continue to keep things going in the right direction,” she commented. Leslie Law and Beatrice Rey-Herme’s LCC Vogue, a 6-year-old Irish Sport Horse gelding (Kroongraaf x Clear Cavalier), rode to a second-place finish, and he said that LCC Vogue has only done a handful of Preliminary level competitions so far. “We could have gone at this at training level, but I thought that the Prelim would be a decent challenge for him, and would be much more educational,” he said. “He’s a lovely horse and he has an incredible future. I’m excited that he was second. I think that this facility is a wonderful experience for the younger horses, and I think in the end it was all done very well,” he noted. Third place went to Alexandra Knowles aboard Katherine O’Brien’s Business Class, a 7-year-old Selle Francais gelding, moving up from sixth place after cross-country. Business Class was imported from Ireland at the beginning of this year. “I actually haven’t done a lot with him due to an injury in March, but he’s an absolutely fantastic horse. He’s cool as a cucumber, and all of the pressure is on me to do it right because if I do it right, he’ll definitely step up to the plate. He cruised around cross-country this week, and was great. I really enjoy riding him and am looking forward to moving up to the next level with him,” she commented. “I thought the course was very fun, and it was very different from anything that I have done before. I really enjoyed it. The facility is second to none-it’s been a great experience. I never want to leave! Everything you need is here, and it’s beautiful. It doesn’t get much better than this,” Knowles concluded. For more information on the 2017 USEA American Eventing Championships presented by Land Rover and Nutrena®, please visit www.useventing.com and to learn more about Tryon International Equestrian Center (TIEC), please visit www.tryon.com. Eric Lamaze and Rosana du Park. Photos copyright Sportfot. Wellington, FL – March 13, 2016 – Week nine of the 2016 Winter Equestrian Festival (WEF), sponsored by Douglas Elliman Real Estate, concluded on Sunday, March 13, with a win for Eric Lamaze (CAN) and Rosana du Park in the $86,000 Suncast® 1.50m Championship Jumper Classic. Kent Farrington (USA) and Aron S finished second, and Olivier Robert (FRA) and Quenelle du Py placed third. The 12-week WEF circuit runs through April 3 offering more than $9 million in prize money. Alan Wade (IRL) set the courses in the International Ring at the Palm Beach International Equestrian Center (PBIEC) for week nine and finished the week with 64 entries in the 1.50m. His first round track yielded 11 clear rounds, and nine of those also jumped clear over the tie-breaking short course. Lamaze was third to go in the jump-off, clocking the winning time of 36.74 seconds with Artisan Farms and Torrey Pines Stables’ Rosana du Park, an 11-year-old Selle Francais mare by Kannan. Farrington and Alexandra Crown’s Arons S finished second in a time of 37.91 seconds. Robert took third place honors with his time of 37.95 seconds aboard Quenelle du Py, owned by the rider along with Pierre Fr. and Chantal Buffandeau. Meredith Michaels-Beerbaum and Windward Farm and Jessica Suida’s Unbelievable 5 placed fourth in 38.07 seconds, and Lorenzo de Luca (ITA) finished fifth in 38.32 seconds riding Stephex Stables and T&L NV’s Halifax van het Kluizebos. Speaking of the competition, Lamaze stated, “I think Alan Wade has done a great job all week. When I walked the WEF (Challenge Cup) I thought it was very big and difficult, but at the end there were seven clear and there were no bad experiences. Then the grand prix was spot on yesterday, and the same thing with this competition. This competition actually walked a lot easier than it rode. It was a really nice competition for bringing your young horse along to the 1.50m level. Lamaze plans to compete Rosana in the Suncast® 1.50m Championship Jumper Classic Final during week 12 and feels good knowing that she has gained valuable experience throughout the circuit. Also competing in the International Ring on Sunday, Mckayla Langmeier and the Charlie Group’s Charlie were victorious in the $10,000 Sleepy P Ranch SJHOF High Junior Jumper Classic. Langmeier also went on to win the $10,000 Hollow Creek Farm Medium Junior Jumper Classic aboard Linda Langmeier’s Durosa W.
Competing on Saturday and Sunday during week nine, the Autism Speaks Small/Medium Children’s Pony Hunter division awarded championships honors to Allison Sinclair and Iwasaki & Reilly’s Somekindawonderful after the pair earned first and second place ribbons over fences. The reserve championship was presented to Aerin Genatt with Joe Currais’s Look at Me, who earned a second place ribbon over fences and a win under saddle. Sinclair, an 11-year-old rider from Winnetka, IL, trains with Maria Rasmussen at Sea Change Farm and has been riding since she was four years old. Her championship win came with Somekindawonderful, a 15-year-old New Forest Pony (by Justice H.R. ), known in the barn as Ronald. This is Sinclair’s first year competing at WEF, and although she did not want do the competition at first, she has had a great time. She was also champion of the Small/Medium Children’s Pony Hunter division in week two with another pony, Webster, and won the championship in week five with Somekindawonderful. Sinclair will compete at the Devon Horse Show, moving up to the Medium Pony Hunters, since Somekindawonderful is already qualified. Her plans then include competitions in Kentucky and Michigan throughout the summer followed by goals to qualify for indoors. The 2016 Winter Equestrian Festival continues with its tenth week of competition, sponsored by Horseware Ireland, on March 16-20, 2016. The week features the $130,000 Horseware Ireland Grand Prix CSI 3* on Saturday, March 19. For more information and full results, please visit www.pbiec.com. Andres Rodriguez and Fifty Fifty 111. Lexington, KY – July 28, 2015 – This spring, Andres Rodriguez took over the lead in the 2015 Hagyard Challenge Series with combined second and fourth place finishes in May, but three riders sit tied for second and are hot on his heels in a close second. 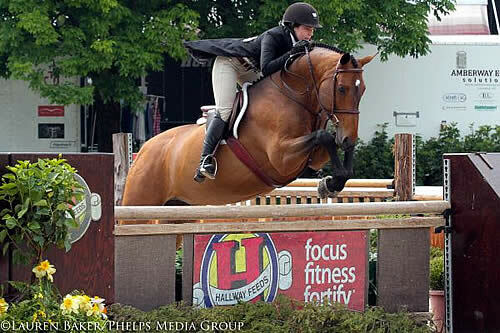 In the Hallway Feeds USHJA National Hunter Derby Series, junior rider Kelli Cruciotti continues to top of the standings after earning two second place ribbons during the Kentucky Spring Horse Shows. In the Hagyard Challenge Series, Bedoya picked up the most recent victory during the Kentucky Summer Horse Show on Quattro, and is tied for second with the winners from the Kentucky Spring Series, Emanuel Andrade of Venezuela and Argentina’s Ramiro Quintana. Rodriguez is in the lead by just 20 points. The Hagyard Challenge Series consists of seven grand prix classes to be held during the 2015 show series at the Kentucky Horse Park. Following the final event, a cash prize of $50,000 will be awarded to the rider accumulating the most points throughout the series, as well as a $10,000 prize for the reserve champion. The Series concludes with the $65,000 Hagyard Lexington Classic during the Kentucky National Horse Show. Following that exciting competition, the winner of the $50,000 Leading Rider will be announced and presented with the prize by the Hagyard Equine Medical Institute. New this year, Brook Ledge Horse Transport will be awarding a $1,000 shipping voucher to the Leading Rider and a $500 shipping voucher to the Reserve Champion Leading Rider. Hagyard Equine Medical Institute is one of the oldest and largest equine veterinary practices in the world. Founded in 1876, the institute offers a staff with qualifications unparalleled by any single non-university veterinary group in the equine industry, and Hagyard veterinarians have dedicated themselves to the health and wellbeing of the horse. The facility at Hagyard Equine Medical Institute offers 13 Digital Radiology systems, 1.5 Tesla Siemens MRI, Nuclear Scintigraphy, an on-site laboratory, an on-site pharmacy, full surgical services, 24-hour emergency services and Hyperbaric Medicine. The institute has practiced veterinary medicine since 1876 and is currently composed of over 50 experienced veterinarians, with 13 board certifications in specialty areas of Medicine, Surgery, Critical Care, and Theriogenology. For more information about the Hagyard Equine Medical Institute, please visit hagyard.com. Several generous sponsors have helped make this exciting series event happen. These gracious supporters include: title sponsor MWI Veterinary Supply, and presenting sponsor Zoetis, as well as Audi of Lexington, Dean Dorton Allen Ford, Hagyard Pharmacy, Brook Ledge Horse Transportation, Hallway Feeds, Pike and Preston, and Stoll Keenon Ogden. The Kentucky Summer Horse Show also hosted the second event in the Hallway Feeds USHJA National Hunter Derby Series. After earning second place during both of the spring horse shows with Totem Pole, Kelli Cruicotti holds the lead. There are four junior riders at the top of the standings, with Lily French ranked second over Helen Voss in third and Emma Kurtz in fourth. Professional riders Molly Sewell, David Beisel, Steve Heinecke and Sarah Sturges are tied with Amateur-Owner rider Missy Luczak-Smith for fifth place. The five-part series will feature a $5,000 Hallway Feeds USHJA National Hunter Derby throughout the spring and summer, and at the conclusion of the series the Leading Rider Awards for the Series will be presented. The $15,000 Hallway Feeds Leading Rider Awards will present a $10,000 cash prize to the professional rider accumulating the most points in the five classes that make up the Series. The amateur rider and junior rider accumulating the most points will each receive a $2,500 cash prize. Riders will receive points only on their highest placed horse in each of the classes. The awards will be presented at the conclusion of the Hallway Feeds class at the Bluegrass Festival Horse Show on August 16, 2015. Returning for the second year, the winning professional rider will win a free flight for a horse in the continental U.S., thanks to Tex Sutton. Hallway Feeds’ close proximity to the Kentucky Horse Park provides the opportunity to utilize the freshest feed, manufactured with time-honored commitments to high standards of quality and the latest scientific advances. Combining a premium nutrition package with a professional level of dedication in horsemen and women provides equine athletes with the Formula for Success. For more information on Hallway Feeds, please visit www.hallwayfeeds.com. The Hallway Feeds USHJA National Hunter Derby Series would not be possible without many generous sponsors including Hagyard Equine Medical Institute, Alfagreen Supreme, Sweet PDZ Horse Stall Refresher, Caddel Equine Therapy Center, Trouw Nutrition, EquiVision, Fenwick Equestrian Products , Tack Shop of Lexington, Tex Sutton, Turf Town Properties and PNC Bank. To learn more about the Kentucky Summer Horse Shows, please visit www.kentuckyhorseshows.com. Kentucky Summer Horse Shows, USEF National Pony Finals, Bluegrass Festival Horse Show and KHJA Horse Show, and the 2015 USHJA International Hunter Derby Finals and the Pre Green Incentive Championship. The Kentucky Horse Show LLC’s 2015 series includes five weeks of top competition throughout the summer. These premier hunter/jumper competitions host the Hagyard Challenge Series with seven grand prix competitions that culminate with a Leading Rider Award, as well as the Hallway Feeds National Derby Series. Kentucky Horse Park, Lexington, KY, site of the 2010 Alltech FEI World Equestrian Games™, home to the United States Equestrian Federation. 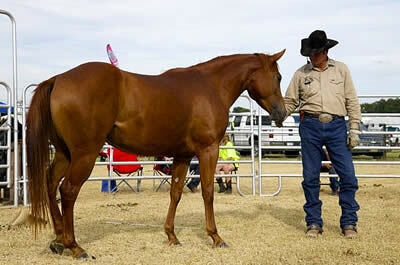 Horse Show Exhibitors may purchase a weekly parking pass at the main Horse Park entrance for $15.00. Dogs are permitted at the Kentucky Horse Park on a leash. The Kentucky Horse Park is located 8 miles northeast of Lexington, Kentucky at Exit 120 on Interstate 75. Vendors offering equestrian equipment, apparel, jewelry, and home furnishings are located adjacent to the Stonelea Ring. Discover the place where elegant comfort in an ideal location meets excellent service and affordability. At the Clarion Hotel Lexington, you’ll find well-appointed accommodations with options of double/doubles, double queens, king rooms or suites, exceptional amenities such as our free hot breakfast buffet, and Southern hospitality at its finest. The best hotel for Keeneland – Located in the heart of Kentucky’s Bluegrass Region – home of the Kentucky Horse Park, the Lexington Convention Center, University of Kentucky, and the Kentucky Bourbon Trail – our Lexington hotel is on Newtown Pike at Exit 115 on I-75, close to all the big attractions, and is the perfect place to stay whether you’re here to get down to business or have some fun. Best of all, bring your furry friends for any trip because the Clarion Hotel in Lexington is also pet-friendly. Reservations may not be made through the Horse Show office. To reserve a campsite at the Kentucky Horse Park for any of the horse shows, please call the Campground store at (800) 370-6416 or 859-259-4157 or email Ryan McGaughey at Ryan.mcgaughey@ky.gov. Be specific as to the show name and the dates you wish to stay. Check-in time is 2:00 p.m. and checkout is 12:00 noon. You must make arrangements with the Campground store if you plan to arrive earlier than 2:00 p.m. or stay later than 12:00 noon. Vehicles that are not removed from a campsite by check-out time will be towed. Ocala, FL (March 20, 2015) — Beautiful horses and beautifully appointed drivers opened the first day of competition at the Live Oak International with the Yellowframe Farm FEI Driven Dressage classes for Single, Pair, and Four-in-Hand horses and ponies. Appearing for the first time as a new father at his family’s annual driving and show jumping extravaganza, Ocala horseman and 11-time USEF National Champion Chester Weber had one of the best dressage phase scores of his career, 33.44, for an early lead in the FEI Four-in-Hand horse division. 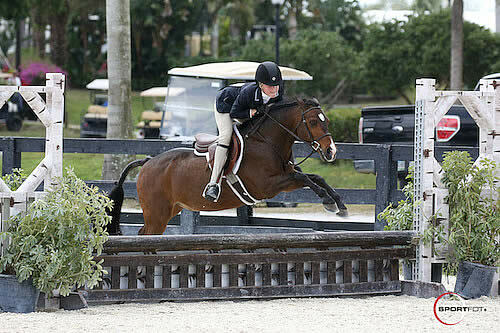 Sarasota, FL entry, Misdee Wrigley-Miller, earned reserve with a score of 46.13. Promising a hotly-contested title in the FEI Pair Horse-USEF National Championships sponsored by Hillcroft Farm are Casey Zubek of Manhattan, IL and Steve Wilson of Louisville, KY. Zubek and Wilson’s one-point margin of difference between first (46.78) and second (47.72), respectively, put spectators on the edge of their seats while Canadian entry, Rae Fischer, kept the international pressure on the American whips with a strong 57.46 score for third. No close margins were to be found in the FEI Single Horse division as Suzy Stafford of Wilmington, DE and her Morgan, PVF Peace of Mind, set a definitive lead of 47.49. The pair’s closest contender, Kent Brownridge of Roxbury, CT and his Hackney, Halstead’s Shale, scored 64.06, seating them reserve ahead of Canadian contenders Catherine Lavasseur (65.73) and Carole Precious (68.22), respectively. Aiken, SC drivers Amy Cross and Jennifer Matheson claimed early dominance in the FEI Pair Pony USEF National Championships sponsored by Hillcroft Farm — until Katie Whaley of Paris, KY and her Welsh pair split the Southern duo’s claim on the top spots. Whaley’s 52.61 was enough to move ahead of Matheson’s 56.58, while Cross and her Welsh Cob held on to their win (42.82) as the first of Yellowframe’s combined driving phases concluded. Tracey Morgan and Fuego 88 claim the FEI Single Pony win in dressage with a score of 43.84. The FEI Single Pony win in dressage went to Tracey Morgan of Belleville, MD (43.84), whose German Riding Pony helped set an 11-point edge ahead of Baptistown, NJ entry Mary Mott-Kocsis. While composing but a single entry to the FEI Four-in-Hand Pony class, Heather Schneider and her grey Welsh stallion were big in personality as they won smiles from spectators for his exuberant ‘neigh’ to the judges before their final 58.40 winning score. Drawing first-time competitors from across the United States to the ‘horse capital of America’ and the Live Oak International was the final class of opening day, the Intermediate Single Pony sponsored by Wayne Humphreys. The Oro Valley, AZ entry of Doris Leacy and her German Riding Pony cross, Katydid Baroness, set a winning standard with a 47.94 test — and other up and coming talent showed throughout the class. Reserve went to first-time Live Oak International competitor, Allyn Carman of Grass Valley, CA (48.64) and Hackney cross, Bud Lite. Third place also went to a debut driver, Deborah Lawrence of Shelbyville, KY and her aged crossbred, Lodestar. 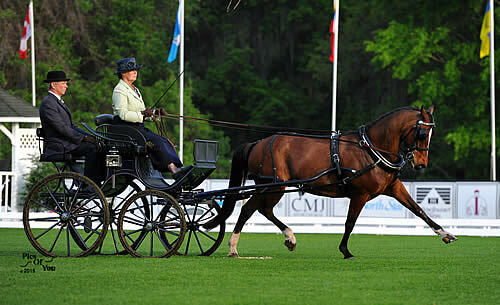 The more than 30 horse-and-driver combinations that performed for opening day of the 23rd edition of Live Oak International in their elegant turnouts will be matched by continued classes on Friday for Yellowframe Farm Intermediate Driven Dressage. Friday will include the return of Intermediate Pair Horse titleholder and former pro football star, Max Montoya, and Ocala hometown favorites Ellen Epstein, Cathy Franks, and Boots Wright. Friday also marks the start of the second exciting chapter of the Live Oak International program — show jumping — with the $5,000 Pasmore Stables 1.35m Power & Speed at 2:00 pm and $10,000 Waldron Wealth Management 1.40m Welcome Stake at 4:00 pm. This year’s CSI2* – W/CAI2* Live Oak International is a World Cup qualifier and has attracted some of the world’s top show jumping riders vying for victory under the live oaks, including recent Furusiyya FEI Nations Cup CSIO5* Hickstead U.S. squadmate, Margie Engle; 2008 Beijing Olympics U.S. team rider Laura Kraut; and four-time USEF Equestrian of the Year and first woman to win Hickstead’s King George Gold Cup, Beezie Madden. Outside the show ring, the Live Oak International is a true family affair, with plenty of children’s activities to delight throughout the weekend, including Kids’ Horseless Jumping Competitions on Saturday and Sunday, and perennial closing day favorite — the Sleepy P Ranch Leadline Class at 1:30 pm before the concluding $34,000 SCI2* Hollow Creek Farm Winning Round at 2:00 pm. For complete results and scheduling, visit www.liveoakinternational.com. Ray working a horse at the Blain’s Farm and Fleet Grand Opening. Morton, IL – October 14, 2014 – When Cathy Roe took her elderly mother to watch Ray Ainsworth, she planned to only stay for one day of the multi-day clinic, but by the end of the day at the Blain’s Farm and Fleet Grand Opening, Roe knew she would be coming back for more. Roe is not alone in being impressed by Ainsworth. Known as THE MAN HORSES TALK TO, Ainsworth teaches horses in a way that makes him one of the world’s most unique horsemen. He has started as many as 10,000 horses, and he now travels the country giving clinics and helping others to start their animals or address behavioral concerns. It was at one of Ainsworth’s most recent clinic stops that Roe came to see him and ended up bringing with her a Quarter Horse/Paint named K.C. Out of the saddle, Roe’s daughter had a difficult time leading K.C. across grass, as he would always pull his head down to the grass and refuse to move. After working with Ainsworth, the problem is a thing of the past, and the ground work that Roe picked up from Ainsworth is something that she and her daughter plan to continue to utilize with their horses. Following his time in Illinois, Ainsworth headed to Alamo, Tennessee for the 16th Annual Buck Creek St. Jude Trail Ride. The trail ride raises funds each year for the St. Jude Children’s Hospital, and this year, for a minimum $25 donation to the hospital, riders could have Ainsworth work with their horse(s). It was at the trail ride that Ainsworth met Tina Evan’s mount, Dakota. After their time with Ainsworth, Evans immediately saw a difference in Dakota’s behavior and plans to continue to practice what she learned from Ainsworth. “When I saddled up to ride him on Saturday after Ray had worked with him, I brought that saddle right around the side of the trailer which normally he would have spooked, but he just looked at me as if to say, ‘Oh, okay, no problem,'” Evans said. “Ray’s a very personable man. I like his gentle approach. He’s very informative and explained every step of what he was doing, which I think is great. When you’re training people you need to explain why you’re doing it, not just do it,” Evans concluded. To come see Ainsworth first hand, find out where he will be visiting throughout the year here. Ainsworth’s next clinic will be held at Blain’s Farm and Fleet Grand Opening in Dubuque, Iowa Oct. 23-25. To learn more about Ainsworth, visit www.rayainsworth.com.